Irish Car Bombs are a very popular way to celebrate St Patrick’s Day, but they’re not the only way to have a little fun with a pint of Guinness. One drink that I like to make is a Guinness Ice Cream Float. This drink is a dessert drink and it is built just like a root beer float, but using Guinness instead of root beer. The ice cream adds some sweetness to the beer and keeps it icy cold while you’re drinking it. Serve it with a straw and a spoon. 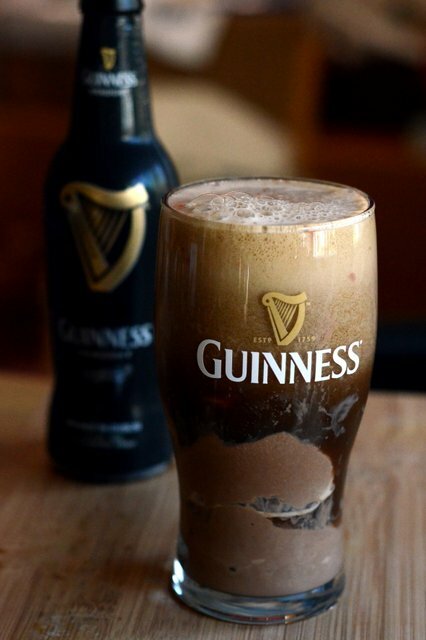 Chocolate and Guinness is a great combination, so I usually reach for chocolate ice cream when making my floats. You can’t go wrong with vanilla ice cream, either, and caramel ice cream is another good choice that highlights some of the malty notes in the stout. It’s not too sweet because the beer is too hearty to be dominated by the ice cream, but it is a great way to end the night after a big St Patrick’s Day dinner. Place one or two scoops of ice cream into a pint glass. Top it off with Guinness Stout.